Disclaimer: Wine tastings at Horn Winery were provided. About a 70-minute drive from Austin, Horn Winery has only been open a few months, but it's producing some stellar wines. Note: It's not so much a vineyard as a proper tasting room, so don't expect rolling hills of vines and grapes. The building itself isn't too much to look at, and the patio overlooks a lot of dead grass, but don't judge a book by its cover y'all. Named for owner Ryan Horn, who has a successful wine-making company called Vitner's Vault, each bottle of wine is named for a musical component or notion, like a Cabernet Sauvignon called Aria (a self-contained piece for one voice usually with orchestral accompaniment.) and is made from grapes in Paso Robles, CA. We started our Saturday super late, so luckily for us Horn Winery is one of the wineries open later (until 7 p.m.) in the area. We sampled pretty much every single wine available (plus a cider! ), and I particularly loved the Petit Verdot Rhapsody (an instrumental composition irregular in form and suggestive of improvisation; an ecstatic expression of feeling or enthusiasm), which was silky and delicious. Also a distillery (I know, what? ), we headed into another room for some samples of their clear liquors, which included vodka made from apples, rum, moonshine, and brandy. It's not necessarily my thing, but it was interesting and our pourer was super knowledgeable about the whole process, making it at least a learning experience, right?! We definitely left the tasting room with a couple of bottles and are super excited to pair the robust red wines with delicious meals. After we left Horn, we decided to try another spot but were turned away from William Chris (pro-tip: make a tasting reservation here! ), so we moseyed into Vinovium just down the road after seeing they too were open much later than their neighbors (9 p.m.--holy cow!). BTW: Although just a couple of minutes away, technically Vinovium is in Johnson City. After being greeted by Nacho the wine dog, we sat at the bar in the small building and were greeted by Daniel Kelada behind the bar who took us through the ropes. Basically, they're known for wine on tap, so you can do some tasting, buy a glass, or even get a growler of wine. They focus on mostly Texas wines, helping people to discover delicious wines they may not have heard of before and even sell kegs to local businesses to help spread the wine love. Our party of four saddled up to the bar while Daniel told us all about the wines we were tasting. We were peckish so we ordered a cheese plate. Because we were so late in the day, they were out of a lot of things, so they told us they'd just make us a tray with what they had left. When it came out, I had to laugh. 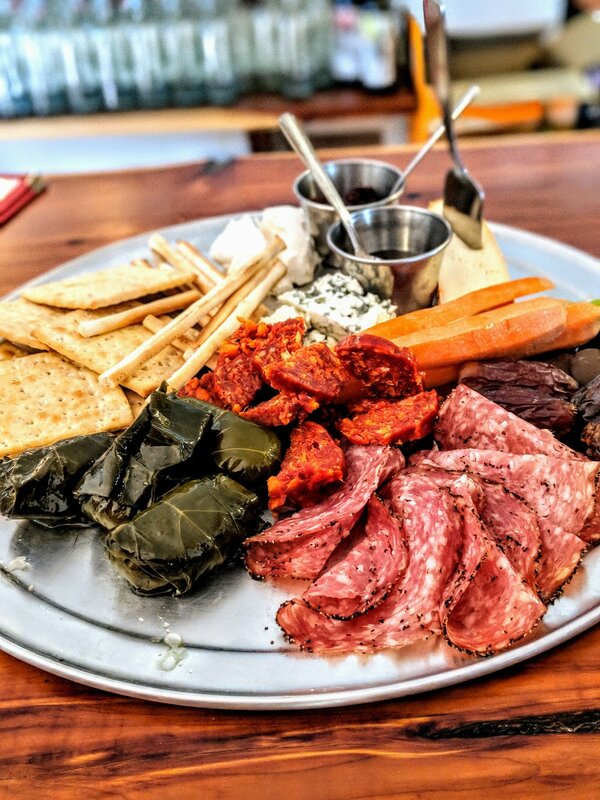 The plate was piled high with salami and chorizo, three different types of cheeses, crackers, breadsticks, dates, and dolmas. It was definitely not something I would have said was from "leftovers" and was an incredibly kind thing for them to whip up for us. Dope meat and cheese plate! Honestly, I can't remember what all we tried, but everything was super delicious, and once Daniel figured out what each one of us liked he kept giving us small tasters of wines he was excited about. We ordered two half-growlers of two different wines and hung out on the patio, which was the perfect end to our Hye day. If you're heading out to Johnson City or Fredericksburg, make sure to head to Hye, where you can enjoy some really delicious wines at both Horn and Vinovium (and William Chris too! ).